This review was written by R. James Orr, Dean of the School of Criminal Justice and Social Sciences of Tiffin University. His review was originally published in The International Review: Multinational Operations and the Law. As the active engagement of US and North Atlantic Treaty Organisation (NATO) troops in the conflict in Afghanistan winds down, the challenges of that conflict, and the legacy of challenges of the conflict in Iraq, continue to resonate in the policy discussions within governments and in academic literature. Throughout the first decade of the twenty-first century, legal literature has reflected an effort to adapt to what has often been characterised as a new era of conflict. 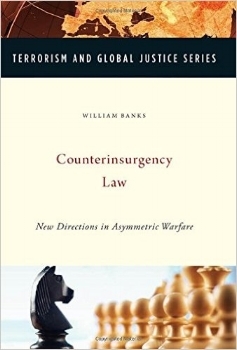 Counterinsurgency Law: New Directions in Asymmetric Warfare, edited by Professor William Banks, is but one of the latest contributions to this literature. The second publication of collected essays produced under the aegis of Syracuse University’s Institute for National Security and Counter-Terrorism, the book provides a collection of well-researched and well-supported papers that serve the legal community. Both publications propose practical analytic approaches intended to help decision-makers and practitioners, as well as scholars, deal with an extremely complex and difficult subject – the targeting of insurgents. They both explore the various bodies of law applicable in determining when the targeting is warranted and under what body of laws the decision is to be made in a manner that provides useful guidance on bridging the gap between theory and practice. While all legal advisers who work in the field of international humanitarian law (IHL) will find the book valuable, its greatest utility is to those who educate and train military legal advisers and those developing doctrine and procedures at the operational or strategic level of command. To download the full review, click here.